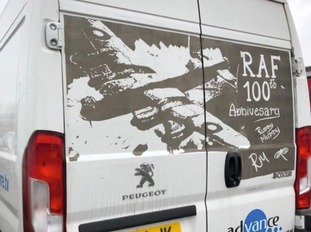 Norfolk graffiti artist Ruddy Muddy has paid tribute to the RAF - as the airforce marks its 100th anniversary. The creator of so-called "mudsterpieces" - artwork made on dirty white vans - has included images of a Tornado and Spitfire in some of his latest works. Living in West Norfolk, Rick Minns, who is known as Ruddy Muddy, said he had to do something to mark the milestone since RAF Marham is based in his "beloved home county". One of the region's senior Church of England Bishops has said Easter offers a message of hope at a time when our society is most divided. A fine and dry day with long periods of sunshine. Becoming very warm inland by the afternoon, with light winds.